When I was in high school I worked at a little meat market and deli that was just a short walk from my house. It was the perfect part-time job for me: I got paid to work with and talk about food while getting a very valuable education in a variety of different meats and their various cuts. The store’s offerings extended past meats, however, and one item that I enjoyed daily were the marinated mushrooms sold by the pound. I have to admit that they weren’t anything spectacular, and probably could be found in supermarket delis across the country. I was nonetheless totally addicted to them, sneaking a taste whenever I had a chance. Recently I’ve been on a bit of a mushroom kick and I thought I’d revisit my old marinated friend. 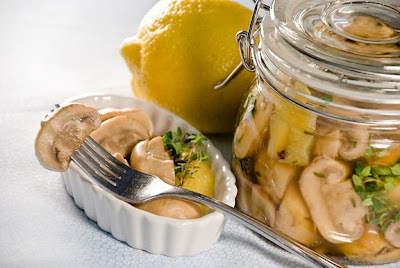 The mushrooms I snacked on as a teen had a muddled flavor of mixed herbs and were often overly oily – I probably used them as more of a vinegar and salt delivery mechanism than anything else. I wanted my updated version to have well defined flavors and much, much less oil. I decided to focus on thyme, lemon, and garlic, and thought red wine vinegar would offer the perfect balance of acidity. If you’re a mushroom and pickle lover like me, I think you’ll find these to be just perfect. The options for using these mushrooms are endless: For sure they’d make a great homemade accompaniment to an antipasto platter. If you are feeling generous, they could be packaged in a pretty jar and given as a hostess gift. Finally if you’re like me, you’ll want to keep them all to yourself, grabbing one or two every time you open the refrigerator—they’ll be gone in few days! With a vegetable peeler, remove the zest from the lemon in long strips, avoiding the white pith underneath. Set the zest aside and save the remaining lemon for another use. In a very large skillet heat the olive oil until almost smoking. Add the mushrooms and garlic cloves. Sauté until the mushrooms are tender and just cooked through, approx 15 minutes. Drain the mushrooms in a colander to remove all excess liquid and transfer back to the skillet (heat off). Add all the remaining ingredients including the reserved lemon zest and toss to combine. Transfer to an airtight container and refrigerate overnight. They’re best the next day, but you can keep them for a week in the refrigerator. Mel, I am not a mushroom lover, but I do like the combination of thyme and lemon. Makes me think of that chicken I love to make. Most of all I enjoy reading every posting you have regardless of whether I like 'shrooms or not. There's always a great story behind every great recipe! Looks and sounds delicious!! Your site is great -- and your quest for sustainable eating lifestyles is both important and admirable. You mention that you do not want to "waste" precious time at the gym, however it should be noted that physical activity, like eating natural and healthy foods, is very important to a healthy lifestyle and should not be frowned upon. Exercise does wonders not only for the body, but for the mind as well. Although some people are not exercise people - it is important. Just a thought! Keep up the delicious recipes!